On a sunny but cold Lancashire day, Math Roberts won the 30th Tour of Pendle (17 miles, 4500 ft of climbing) in a very impressive time of 2:17:22. Good running conditions made for fast times and Math was pushed all the way by Yorkshire fell running legend Ian Holmes (Bingley) and Calder Valley’s emerging talent Tim Ellis. Math’s excellent vein of form saw him edge ahead of Holmes on the fast run in to the finish and his winning time is the 14th fastest on record. Since his summer sojourn to the Pyrenees, Math has achieved several notable finishes, including 7th at Pedol Peris and 4th at Langdale Horseshoe. However this victory is probably the best of his fell running career. Further down the field, Johnny Moore finished 37th (2:40:48), just ahead of the ladies race winner Jasmine Paris (Carnethy). A total of 421 finished the race. See report below from Maggie who very kindly covered for me at the cross country at the weekend! Well done to everyone who did make it to run – brilliant! Let’s start the new year with a good turn-out at Lilleshall – will be in touch about details/travel plans but for now, put it in the diary. Well the third cross country fixture at Ysgol Morgan Llwyd on Saturday was an afternoon of mixed fortunes for the club, wonderful women and missing men! The women were well led home by Andrea (O35), followed by Megan (O35), Jo (O40) and Wendy (O35) packing well together. Sandra (O45) and Ellie (O50) finished next with Bronwen (U17), Hayley and Helen (O45) finishing before Don (O70). Alison (O45) and Maggie (O65) made up the women`s team. For the gallant men, Craig (O40) finished 42nd, with Arwel (O55) 54th, Kean (O55) 91st, Steve L. Jones (O55) 100th and Jeremy (O55) 117th. Thanks to all who turned up (and to Gary for sending apologies for absence due to injury) but where was everyone else? Considering the men`s team have won the league the last two years and that the club has such a large male membership, it was very disappointing. The team will incur a penalty for not having the required number of six runners but the Male Masters team will have done well! Hopefully the club will be able to field a full men’s team for the remaining fixtures at Lilleshall (Jan 18th) and Oswestry (Feb 8th). Team results, aggregate positions and individual results will be posted here shortly. There were 23 Eryri Harriers amongst the 2222 finishers in the Conwy Half Marathon on Sunday 24th November run in ideal conditions. There were some very good times considering the race route includes a climb up and down Llandudno’s Great Orme with Kenya’s Benson Olenakei Oloisung’A a clear race winner as he led from the off to set a new course record of 65:56. He was followed by 6 time Snowdon Race winner Andi Jones 66:41 with Colin Leak 67:31 just holding off Eryri’s Rob Samuel 67:33 for 3rd place. The women’s title went to inform Oswestry Olympian Ali Lavender who fnished 20th overall in a good time of 78:40 followed by Megan Crawford (Fife AC) 79:34 and 3rd Diane McCormick (Wilmslow) 80:14. Brendan Rothery’s 9th (2nd MV/35) place finish in a time of 73:30 was enough for him to retain his Eryri Road Running Championship title with: 10th and in a Personal Best time for the distance, Jordan Evans 73:54. 35th Dewi Owen 81:33. 39th Arthur Connell 82:27. 55th Aaron Nicholas 84:31. 57th (2nd MV/55) and after representing the club in the North Wales XC League at Wrexham the previous day, Arwel Lewis 84:47. 58th Huw Owen 84:57. 59th Paul Jones (though his chip time was 84:55 and would have placed him ahead of Huw! Paul crossed the finishing line behind Huw with a Gun Time of 85:03. 76th Rhys Ab Elwyn 86:35. 96th Jason Parry Jones 88:14. 139th Iwan Edgar 91:08. 153rd Brian Wills 91:32. 170th Jonathan kettle 92:32. 176th Phil Targett 92:53. 212th Tony Woodall 93:39. 277th Jonathan Tyler 97:22. 303rd Emlyn Owen 97:51. 407th Arfon Bebb 1:40:22. 648th Chris Baker 1:45:47. 1058th Gwyn Evans 1:56:18. 1701st Roy Jardine 2:13:26 and 1846th Iorwerth Roberts 2:15:02. Eryri’s men just pipped Wilmslow by 1 point to win the team title. A superb, scenic and well organised event which is now established as North Wales biggest Road Race. Celebrating Jeremy Williams birthday. 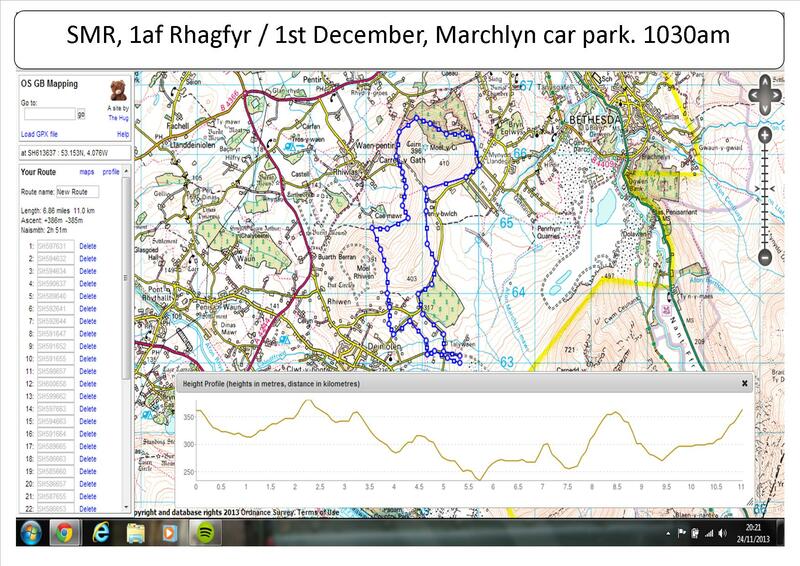 A strange 7 mile loop for this weekend’s SMR – meeting at 1030 at the top of the Marchlyn Mawr – Dinorwic road (GR: 598631). The route will head for the infamous summit of Parc Drosgl before looping around Moelyci with the option of heading for the summit, finishing off with a climb up the legendary Bwlch Rhiwen and back to Marchlyn. S’no’fun, Sunday Morning run, 24th November, 10.20 for a 10.30 start. Royal Victoria Hotel, Llanberis, far/south end of car park. Park where you can in Llanberis and meet at the Vic. not the first on the tops this year, but perhaps your first touch ? 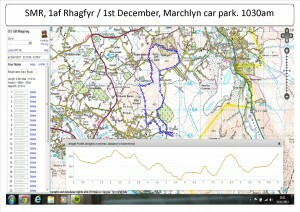 An easy run up Yr Wyddfa, Snowdon and back, 16km/1000m. Forecast is sunny, gentle N-E’erly breeze. Llanberis 6C, summit 0C ! Bring bumbag, hat, gloves, extra layer, studded fell shoes. Re-fuelling afterwards at Pete’s-Eats, Llanberis, ~1pm. Jeremy. Following a review of the club training nights by the new Training Coordinator (Rob Samuel), the training sessions have been decided upon. 6.15pm- Meeting at The Heights Carpark, Llanberis. The session will be open to everyone, from newbies to people who have been training for years. It doesn’t matter what your ability is, the session will cater for everybody and be all inclusive and a chance to meet lots of like-minded people, improve your fitness and have fun in the process. The session will be varied each week, between flat sessions on the cycle track, hill reps and grass sessions. Meet at The Surgery at 7.15pm (GR580600). Between 60 and 90 minutes. In the dark depths of winter the run is usually made up of a circuit of street-lit, hilly roads from the centre to the outskirts of Llanberis. All levels are catered for as there is a ‘re-group’ at the top of each hill! After the clocks change in late March the runs go further into the mountains as the evenings get lighter. The group is usually between 5 and 10 runners; Eryri members, prospective members and friends are all welcome. The popular winter 10.30am social trots will be starting up again soon, details to be advertised, but believed to be the first one on the 1st Dec. watch this space! Matthew Roberts representing Wales, took 5 seconds off his 10k PB time in the Leeds Abbey Dash event on Sunday 17th November finishing 51st overall in a time of 31:20 while the wheels came off for Daniel kashi who was hoping for a time around 32 minutes, finished 186th in a time of 33:52 (Chip Time). In all, there were 14 athletes under 30minutes with Wales led home by Swansea’s Dewi Griffiths who finished 7th overall in a time of 29:32 which was just 9 seconds behind the race winner; Matthew Hynes 29:23. 6 Eryri Harriers made the journey to Tattenhall for the opening race of the Borders Road Running League 2013/14 season with Brendan Rothery leading the way with a 3rd place finish behind Deeside athletes Steve Boyton and Ricky Challinor with: 8th Jordan Evans. 79th (and after representing the Welsh Masters XC Team in Cardiff the previous day) Arwel Lewis. 185th and on his Border league debut for the club, Kean Rowlands. 296th Allison Donnelly and 319th Roy Jardine. The ever popular Pen Fell Race was blessed with cracking conditions for this year’s event; fine and dry weather, and firm ground led to some great personal performances. Dylan Jones led Eryri to a storming overall result, after he overhauled Buckley’s Jez Brown in the last couple of miles. Brown looked to many onlookers to have it in the bag, but he didn’t have it his way in the end as Dylan’s form proved too much. There was a good battle going on behind for the other podium position as unattached runner Sam Orton clung on to third for most of the race, with John Parkinson and Matt Fortes quite some distance behind until checkpoint 2. Thereafter he suffered following the road section and they quickly passed him, and then fought it out until Matt beat John by a mere 19 seconds to claim the position. And with the first two finishers also both V40s John also took third V40. It was an Eryri 1,2,3 in the v50s with Russell Owen, Michael Belshaw and the ‘almost 60’ SPJ sweeping the board. Watch out all the other v60s next year as Steve ‘matures’ and gives them all something to worry about! Jayne Joy of Helsby prevented Eryri from having another winner as she narrowly beat Andrea Rowlands, with Lisa Grantham of Chester safely third but not threatening the other two. Ellie Salisbury claimed third v50 for the club, and first local lady along with it. The team prizes also went to Eryri for both the men and women. A successful race, 190 out, 190 in! Weather great which always helps. Usual characters here, great to see Dylan Jones back to good form. One name to watch (if he puts his mind to running properly) is first local Sam Roberts – son of the super talented and legendary Emlyn Roberts (old-course record holder). I would like to thank the committee members past and present for the support given to me during my three year tenure as club Chairman. I am now standing down from the post, but will continue to be involved in the workings of the club via the post of webmaster. Others standing down this year are, Maggie Oliver (Honorary Secretary & Cross country Rep), Alex Fletcher (Membership) , Trefor Jones and Eurwyn Edwards (Ordinary Members). I am handing over to the new chair, namely Paul Jenkinson, who most people already know as the Junior Training and Safety Officer for the club. I wish him well in the new role. There are also other new club members who have joined the committee this year, namely Stuart McDonald (Vice Chair); Emma Green (Membership Secretary); Becki Law (Cross Country Rep); Rob Samuel (Training Coordinator); Kate Worthington (Ordinary Member). I would also like to thank all the other club members for their support over the period, and look forward to spending more time running rather than writing emails about it!